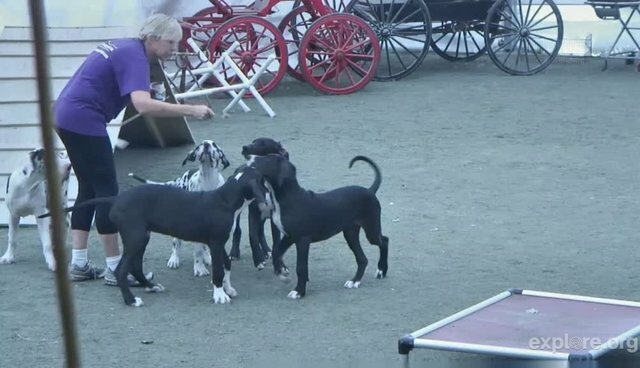 If you think they look big now, just wait until these Great Danes are full-grown. Come back when the weather is nice and you can catch these guys at their favorite activity - spoon feeding! And they need to be fed a lot. Great Danes are one of the world's largest dog breeds. Adult males range from 30-32 inches, while adult females range from 28-30 inches. What you are watching: The puppies on the livecam below range from a few weeks to about one year old. Best viewing hours: 7 a.m. - 5:30 p.m. (Eastern Time). If the video is not live, click here to view other Explore.org livestreams. These puppies will soon be placed by The Service Dog Project with individuals who have mobility limitations. The project enhances the lives of disabled veterans and children with Multiple Sclerosis. To learn more, visit Explore.org and click here to support the Service Dog Project.